The cutting gear made by Ortofon includes treble limiters in both electron-valve and transistor topologies. These treble-limiters are not dynamics processors having three stages of limiting, however. (; They are single-stage limiters that can be made to react to only the components of the complex signals that are at thrice the frequencies of the midrange signals. The traditional midrange frequency used for tape recorder calibration is 700 Hz (and, later, they started using 1,000 Hz). As long as we are talking about frequencies over 2 kHz, we are safely in treble territory. I finally sorted out what was wrong with the left-right channel balance on the STL631 treble limiter that I acquired a couple of years ago from a colleague, who did warn me that it "needs work." The thing turned on, and the needles moved to the right, but the output channels were not matched in level, and yet there was no way to trim-adjust the outputs. Although I renewed the tubes, I held little hope of solving the matching issue, since the mismatched output levels were apparent even when the filter was bypassed and the signals were just passing through the unit - whether off, or on. Examining the signal path as drawn in the schematic revealed that, when the filter is bypassed, both channels only send the input through a 1 kOhm resistor before hand-off to the output. When the filter is switched in, additional components are introduced, but those seemed to have no worsening effect on the channel mismatch. Left was always down by about 8 dB, compared to right. 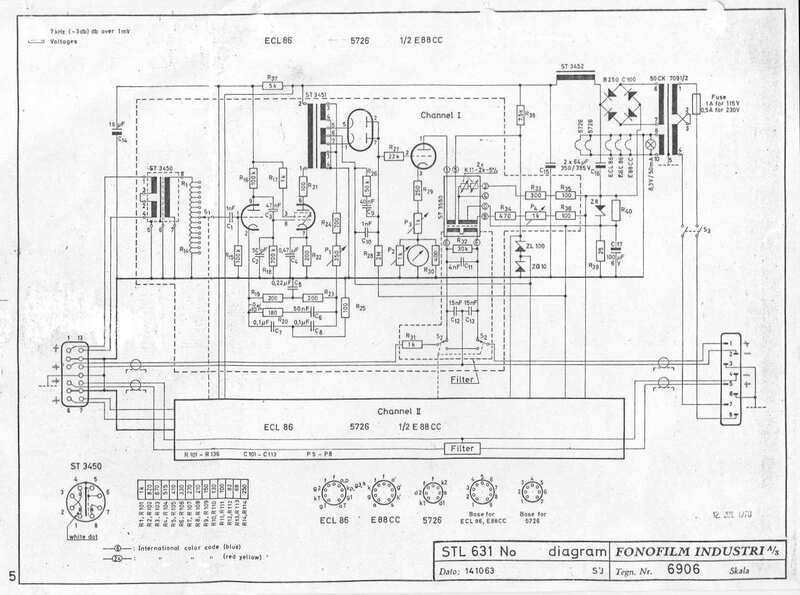 However, the schematic solved the issue. Something had to be wrong with (at least) one of the two 1 kOhm resistors, or another source of resistance was somehow in the left channel that shouldn't be there. After sliding off the mu-metal cover, which has sliding snake connectors for the chassis' program and side-chain inputs, program outputs, and AC power inputs, I noticed a new-looking 1 kOhm resistor soldered between two of the riveted through-hole stand-offs. (Alas, the board has no pin-designating legend, but the Fluke has a convenient, audible continuity test mode.) Unfortunately, that new resistor, which was obviously soldered "in-the-field," measured pretty close to the schematic at 1.07 kOhm. But I wasn't sure which of the two channels it was for... When I turned the unit up-side-down, I saw the mirror-image of most of the layout of components from the first side. However, there was not a 1 kOhm resistor in the corresponding position. There was an old, carbon film 3.3 kOhm resistor. It measured 3.5 kOhms and must have been dropping the volts on the left channel, compared to the right. which had the 1.07 kOhm resistor (only) in line. Perhaps, the person who repaired this many decades ago was about to install the proper value resistor when the door bell or telephone rang. By the time she got back to the soldering, she accidentally grabbed a nearby resistor, thinking it was the same one she had placed next to the work. Or some M/S-only mod. After I replaced both of those resistors with two cherry-picked, new, 1.02 kOhm carbon film resitors that I had in inventory, the channel-matching became perfect. The only remaining issue seemed to be that the treble response might be slightly drooped. A 10 kHz sinewave soundfile was playing out of the limiter at about - 4 dB compared to the 500 Hz sinewave soundfile... When I played music through the unit, it sounded nice, and much improved from before, but obviously had some high end roll-off, although it was matching on both channels, even though the side-chain inputs were not receiving a signal. Alas, the overall response from bass through treble is designed to be within +/- 3 dB from true, so that might have been in spec, but I won't be surprised to find several parts being in need of replacement. The next time I get a chance, I'll try a sweep of tones and see what's going on. As for the side-chain operation, if dynamic reduction of treble is invoked, by feeding the side-chain inputs a copy of the program, the limiting is uniquely in response to treble if the side-chain audio has been filtered for cutting with the RIAA encode equalization, since that causes bass to be greatly reduced in strength and treble to be greatly boosted (by about 20 dB at the extremes). The large knob on the left of the front panel called, Common Level, controls the side-chain levels going to both channel filters.